It’s always been difficult choosing topics for the WIR. I post upwards of 100 articles a week, from both commercial and movement sources, on our companion Monday-Friday Labor Advocate news blog. That’s more a smorgasbord than a menu. But sometimes without warning I choose to expand a single story to include some lessons from the past. Next time I’ll return to the normal assortment of issues but for now I ask your indulgence as I recall events from my youth that qualify as history for most readers. Unfortunately, I saw it only after publishing the last WIR. When I checked out the Workday Minnesota website last Tuesday there was this prominent photo of Vincent Raymond Dunne being “escorted” by a squad of very young and nervous National Guardsmen. It was a scene from the 1934 Minneapolis Teamsters strikes when the Farmer-Labor Party Governor declared martial law and interned strike leaders and activists in the fresh air venue of the State Fairgrounds. Known as Ray, or V.R., Dunne was a central leader of that strike and of the Trotskyist socialists who were the chief strategists in its ultimate victory. An excellent film not only chronicling the Minneapolis strikes but also setting the world economic and political context in which it was waged–aptly titled Labor’s Turning Point–was produced by John De Graaf in 1981. Farrell Dobbs, a socialist strike leader who became the principal officer of the Teamsters Local wrote a definitive history, Teamster Rebellion. Bryan Palmer, a Canadian socialist historian and biographer of James P Cannon, published extracts from his Cannon research about the strikes, Revolutionary Teamsters: The Minneapolis Truckers’ Strike of 1934 that is well worth reading. It was my privilege as a young member of the Socialist Workers Party to spend some time with Ray after I transferred from Chicago to the Twin Cities in 1965 to help expand party efforts in building the rapidly growing anti-Vietnam War movement. While Ray didn’t do much writing, his memory remained sharp to the end and he was an excellent source of “oral history.” But that had to be on his terms. In the mid-Sixties Ray was ensconced in a comfortable chair in the kitchen of the party headquarters at 704 Hennepin just about every day. He was eager to talk to “the youth”—but mainly wanted details about the party’s current work. I pledged to keep him up to date on the antiwar movement that was his main interest. But I also requested, and often received, discussion about various questions from back in the day. I wasn’t shocked to see this photo reprinted on a labor website. The ’34 strikes remain an honored part of labor’s heritage in Minneapolis and there are big celebrations of its victory every few years. Ray’s grandchildren—active in the IWW as their grandfather once was—are always participants. But my curiosity was aroused by an accompanying headline One Actor Show Portrays Leader of 1934 Teamsters Strikes. I was downright surprised to see the lone actor was Howard Petrick. 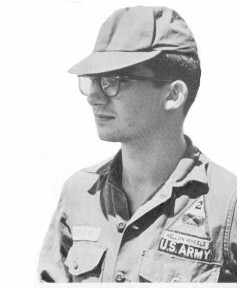 The lad I knew as Howie in the mid-Sixties in Minneapolis when we were both trying to learn something from Ray Dunne and other “old-timers,” later became a national antiwar hero as Pfc Howard Petrick. There were many who resisted the draft, or moved to Canada during the Vietnam war. Rather than these individual solutions the SWP wanted to build mass collective action to secure a just end to the war. Prior to the Second World War, the party adopted a Proletarian Military Policy. Basically, that meant that as long as the majority of working class youth accepted conscription it was our duty to join them–while continuing to exercise our democratic rights as citizen soldiers to oppose the unjust war. SWP members were killed and wounded in battle and at sea. But that policy had to be adjusted after the Truman administration established a list of “subversive” organizations that included most left groups, among them the SWP. We didn’t ask to be removed from the list—we rejected its concept as an unconstitutional political witch-hunt. Part of the paperwork of induction in to the Army was the infamous “Form 98” which required either affirming or denying membership in any group on the government’s enemies list. We wouldn’t agree to being “subversive” but denying our membership could lead to perjury charges. We chose instead to return it blank on the grounds that our political views were not relevant to our service as soldiers. What usually happened at that point during the Vietnam era was the induction process was halted pending further investigation. The Army would check with the FBI and when their informers verified our politics we were told our service in the Army would not be in “the best interests of the United States.” We would be reclassified as 4-F, a designation that usually meant being physically or mentally unfit–not a good thing to put on a job application. That was how they dealt with me. But under pressure to continually replenish hundreds of thousands of conscripts for two-years of service every year some things fell through the cracks. Breach of paperwork protocol led to Petrick being inducted and sent to Ft Hood, Texas—named after a Confederate general–to become a soldier. After completing the rigors of basic, Petrick was assigned to further training as a cook. That proved to be fortuitous because, as I can testify, he already had both interest and skills in food preparation. His C.O. was pleased with his work, gave him several commendations, and hoped to keep him as permanent party to help train future cooks. But while becoming a model soldier Petrick did not neglect his mission as an antiwar socialist. Off duty, he discussed his views with fellow GIs and distributed antiwar and socialist literature. On weekend leaves, he started participating in civilian antiwar demonstrations in Killeen and Austin. That, at last, caught the attention of Army Intelligence. In April, 1967, trained investigators searched Petrick’s personal belongings and discovered his stash—of literature. They assigned an Army lawyer who advised him to prepare for a court-martial on charges of making disloyal statements, subversion, and creating disaffection. Those were serious charges that could have led to time in the stockade, loss of pay, and dishonorable discharge. Fortunately, Petrick didn’t have to rely on his Army attorney. He received powerful support from two sources. First and foremost was SWP and Young Socialist Alliance efforts in organizing a Committee to Defend the Rights of Pfc Howard Petrick. The committee letterhead listed dozens of prominent sponsors including Julian Bond, Ruth Gage Colby, Noam Chomsky and Staughton Lynd. They also mobilized support from virtually every component of the growing antiwar movement. Petrick also had a family connection to the biggest UE Local at the GE plant in Erie, Pennsylvania. That union had considerable experience in fighting witch-hunts and they helped in getting the Emergency Civil Liberties Committee to assign two top constitutional rights lawyers to represent Petrick. They also arranged for a labor reporter for the Wall Street Journal to write a substantial article that caused the Army some embarrassment. The Army soon backed off their threat of court-martial saying they would instead discharge him—hinting it would be less than honorable. Petrick–citing his unblemished service record—replied he would accept nothing less than honorable discharge. Anxious to end the fight, after some haggling Petrick was able to return to civilian life with his veteran benefits intact. Howard Petrick was neither the first nor last antiwar GI to run afoul of the Brass. But his model defense effort was an early victory for GI rights that had a lasting impact. In the early Eighties a new generation of SWP leadership carried out a big transformation in the program, strategy, and internal democracy of the party. Dozens of members—including me–were expelled. But that’s a story for another time. Like too many old comrades, I had lost track of Howard Petrick over the years and was pleased to learn he was not only alive and well but passing on the lessons he had learned from Ray Dunne to new generations. One of the venues for Howard Petrick’s performances was the St Paul East Side Freedom Library. They are hosting another special performance event A Resisters Handbook October 21. It is written and performed by Javier Morillo, president of Service Employees International Union Local 26 in the Twin Cities. Details here. The loss of life and property inflicted by Harvey and Irma has not yet been completely tallied even as Maria threatens some of Irma’s recent victims once again, Jose’s wanderings leave its ultimate course unverified, and Max and Norma are still developing off Mexico’s Pacific coast. Though not nearly enough, more attention is also finally being paid to wild fires in the west. Sparked by heat waves and tinder dry conditions, major fires have been raging from British Columbia south to Baja California. One in Montana exploded to burn 78 square miles overnight—the size of Brooklyn as noted in the New York Times. Others have been within Los Angeles County and more have been close enough to cities like Portland, Seattle, and Denver to keep people indoors because of the smoke. As the map above illustrates, what happens in the west doesn’t always stay there. Smoke and ash in elevated areas gets carried by prevailing winds east over the mountains adding haze and other pollutants to seasonal allergens in far-flung places like my hometown of Kansas City. The EPA has reported the most “unhealthy air days” in ten years. The Bureau of Land Management predicts there will be many more such summers. Neither are allowed to mention global warming as a factor. The Trump administration has instead opened up vast new areas of public lands in the west for drilling, fracking, mining, and cattle grazing—including the pristine Arctic Wildlife Refuge. Currently, it’s difficult for a boss to fire a worker, harder still to close a plant. Decades ago, French workers also won a 35-hour work week and several weeks of paid time off every year. These benefits are not subject to collective bargaining—they were secured by legislation that guarantees them to all workers. French capitalists and their politicians blame these laws for sluggish economic growth and high unemployment. The brother is spot on in nailing the inutility of believing that eliminating the best worker protection laws of any major industrialized country will create more good jobs upon which to build an acceptable life. But some of the more conservative unions and reformist parties argue that resistance to the Borg-like Juggernaut directed by Macron on behalf of French capital is just as futile. The September 12 strikes and demonstrations were just the first shots fired in the working class counter-attack—and there’s plenty more ammunition, and other tactics left for a fight to the finish. Their track record in previous skirmishes is good. And Macron should be mindful that even deGaulle came close to being overthrown by workers, farmers, and students in the revolutionary situation in France during May-June 1968. The most prominent socialist in the Democrat Senate Caucus has introduced a new complex variation of single-payer health care reform co-sponsored by a third of his Democrat colleagues. Some of them are viewing it through 2020 vision—hoping to use it to advance their chance of being on the Donkey ticket in the next presidential election. But 32 Democrats in the upper chamber are responding like the Devil takes to Holy Water. “My” Democrat Senator, Claire McCaskill, is suspicious of anything that threatens the profitability of her family’s holdings in nursing homes. Liberal groups like the Our Revolution remnant of Bernie 2016, and Democracy for America, are uncritically excited about the Sanders bill, circulating petitions and raising money around it. My old friend Mark Dudzic, coordinator of the Labor Campaign for Single Payer, and the last National Organizer of the now defunct Labor Party, gave a more measured response in an interview by Labor Notes. But what is actually proposed—and ignored—in the Sanders bill? It is a far cry from the Labor Party Just Health Care version of single-payer which was a greatly enhanced upgrade of Canadian-style care pioneered by that country’s NDP labor party. Unlike the funding uncertainty of the Sanders proposal, Just Health Care was accompanied by a financial Briefing Paper that showed how the working class majority would pay less for better coverage. And JHC even provided for a Just Transition for billing and other clerical workers made redundant when private insurance is eliminated—another provision absent from both the Sanders Senate bill and the Conyers bill in the House. Regular readers know I have long been critical of Medicare for All as a slogan for single-payer. Medicare, increasingly whittled away by privatization, is not the blessing for us old folks that too many imagine. Between my Part B deduction from Social Security, my Blue Cross supplement to pay for what Part B doesn’t cover, and further uncovered prescription drugs and eye glasses, my out of pocket expenses eat up more than half of my Social Security benefit that is my only regular income. But for Sanders Medicare for All is not just a catchy slogan. His bill would literally expand Medicare coverage—with some improvements—to everyone over a four year transition period. Anticipating many of the objections already being raised, especially the uncertain financials, Sanders accepted a likely fallback retreat insisted upon by Senator Gillibrand of New York—a return of the murky “public option” competitor with private insurance last supported by the AFL-CIO, rejected by President Obama, during the passage of the current Affordable Care Act. The mish-mash Sanders bill does little to educate and prepare the working class for genuine needed health care reform. It is designed to be campaign material for liberal Democrats in the 2018 and 2020 elections. The best health care example remains the socialized medicine of the National Health Service established by the British Labor Party which will mark its seventieth anniversary of operation next July. Most hospitals are publicly owned, most medical and dental professionals and support workers are paid by the government and all services, devices, and most drugs are free to users. Promoting Just Health Care instead of the British model was a tactical decision by the American Labor Party. Its goal was to neutralize opposition by actual care-providers while eliminating the insurance parasites. The struggle has not yet advanced to a point of testing the validity of that tactic. While socialized medicine would be better, Just Health Care is a reform worth fighting for if the doctors stay neutral. The British and Canadian experiences demonstrate that it will take a working class party to get the health care system that workers in the world’s richest country need and deserve. The Democrat Our Revolution won’t cut it.